On Sunday, my friend Isabel Anders, gave me a copy of her latest book, one of over twenty inspirational books she has written during her career as a spiritual writer. 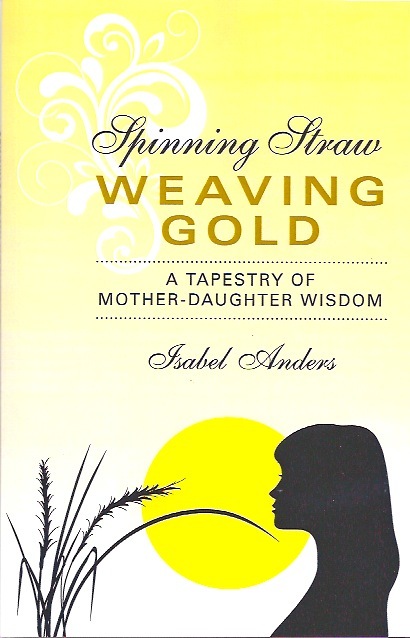 Spinning Straw, Weaving Gold, A Tapestry of Mother-Daughter Wisdom contains poetic conversations between mother and daughter about female spirituality that is connected to the physical and material, such as the actual weaving of cloth. The conversation is a metaphor for the spinning and weaving women do to create their tapestries of wisdom to be passed on to future generations of females. Anders invites reader to consider how spinning that which comes to women in the good and bad circumstances of their lives enables them to weave straw into gold, especially when the weaving and spinning are operations of love. 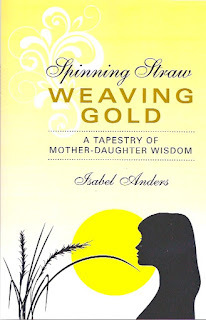 Spinning Straw, Weaving Gold is the second in a collection of that which Anders calls “uncommon mother-daughter dialogues” that call attention to the small scenarios of women who struggle and become successful in the weaving of their various tapestries. This is a book of poetry and meditations derived from the world of women and grounded in spiritual wisdom. After reading it, I know that each time I announce the Gospel (as a deacon) in church, I’ll think of Sophia and how the Greek Orthodox deacons say that name preceding the Gospel because it means that they are reading “wisdom” to the congregants – I’d love to announce the reading that way, and I know that if I did, Anders would be among those in the congregation at St. Mary’s who would vigorously nod her head at the invocation. Complete with notes, Study Questions, and Bibliography, this small volume is tightly woven with wisdom in dialogues created from the pieces and scraps of Anders’ own life…and that of many writers of wisdom literature. The result is a rich tapestry of carefully-chosen colors. Thank you so much, Diane! Spinning Straw, Weaving Gold releases on June 16, and I hope the e-book will be available on Kindle then too!